Is there anything more amazing than looking across the couch at your significant other on a beautiful, cool Sunday morning–coffee and book in hand, cat rolling around on the floor–and realizing you have nothing to do that day? Of course, I can only handle that feeling for a little while and then I feel compelled to do something. Horrible thing, nature of my character. This time, the “thing to do” was a lazy bike ride to some local spots we’ve been meaning to see for more than a year. It’s incredible and depressing that life is so busy you can live somewhere and not explore the surrounding 30 mile radius of world around you. I’m determined to put an end to that, one day and weekend at a time. We headed west to find a little dive bar called Teschner’s Tavern in Richfield that the fiance’s work colleague recommended, claiming they had the “best burgers ever.” We almost drove by–it doesn’t look like much from the outside and there was no one there when we arrived. The inside wasn’t much better–no decor, just a long bar, a couple booths, a pool table and some old TVs. We each ordered a burger, and they were pretty good, although maybe not the best ever. I ordered a burger with mushrooms that had been soaked in a blackberry alcohol concoction, and they were delicious. The combination of burger and sweet and alcohol kick was really good. The fiance ordered a burger with red hot sauce and it was just ok. Both sandwiches were huge and luckily we had the tank bags so I could take the majority of mine to go. There were several other places to eat in Richfield, several of which seemed very motorcycle friendly. We will definitely be back on the bikes. 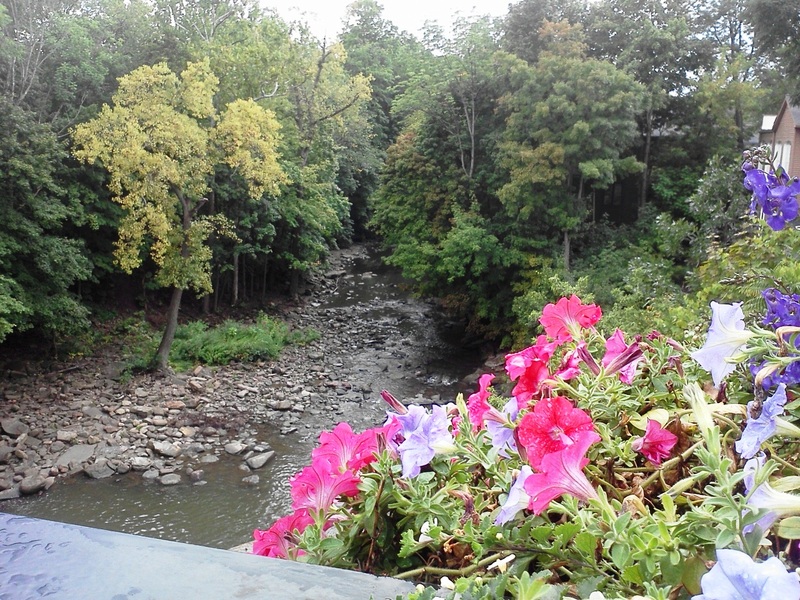 From there we buzzed over to Chagrin Falls. It’s been on my list and is only about half an hour from our home. Unfortunately it started to pour as we were in the outskirts of town so we were soaking wet when we parked right in the downtown area just as the sun broke through. I wish I were the type of person who considered all of that an adventure, but instead I’m the kind of person who was in a pretty foul mood as we set off to walk around. It didn’t last long. The storm clouds, both in the sky and in my mind, cleared pretty quickly as we started to explore. 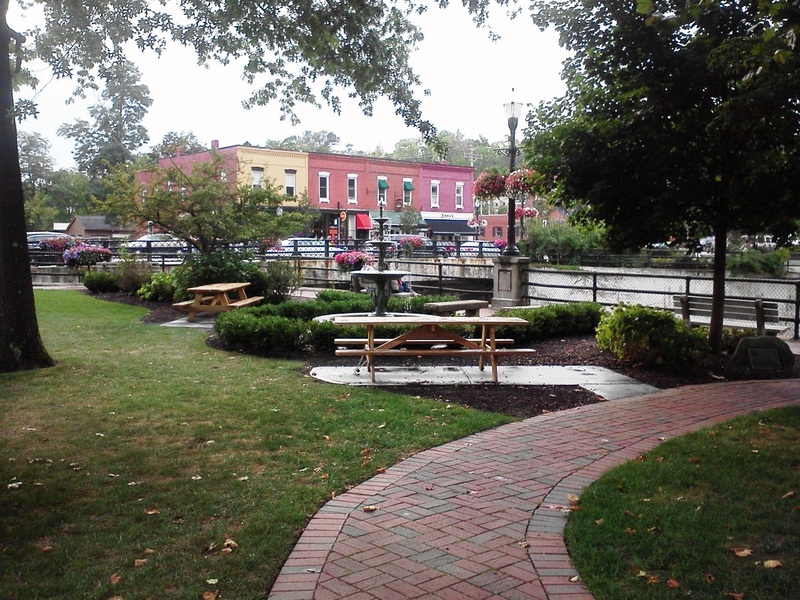 Downtown is very cute, quaint and walkable. We hopped over to a little park area to see part of the smaller “falls” area and then crossed over the bridge to check out some shops on either side of the street. We headed down a little side street, following signs for viewing the falls, and followed a little walkway between Dave’s Cosmic Subs and Jekyll’s Kitchen (which has been recommended to me numerous times–it has an awesome patio and beautiful seating inside and outside overlooking the falls!) 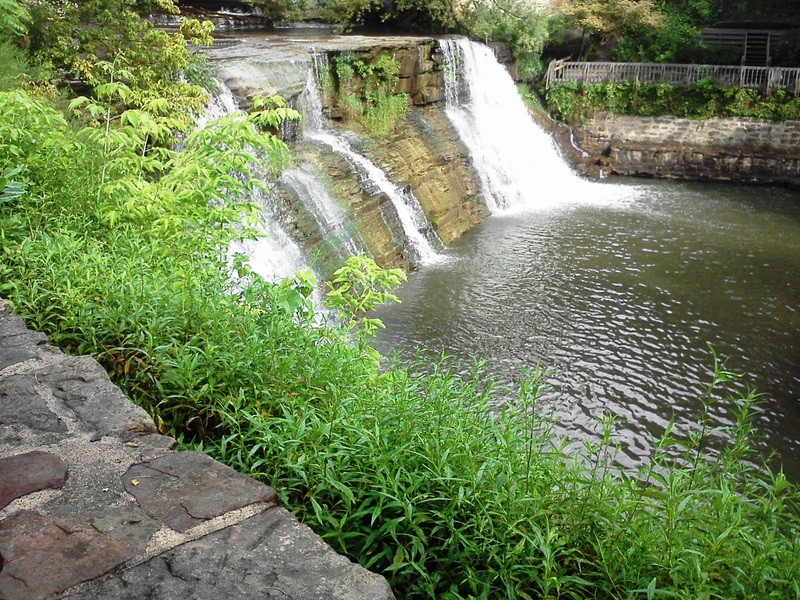 that winded down closer to the falls for a beautiful view. We decided we would have to check out the restaurant soon, but I think it would be beautiful any time of year– with the trees in different colors in the fall or just blooming in the spring, or with everything covered in ice and snow. It seemed like the water was fairly low– there were quite a few exposed stones down in the river bed and the falls were really only coming down on either side of the drop. 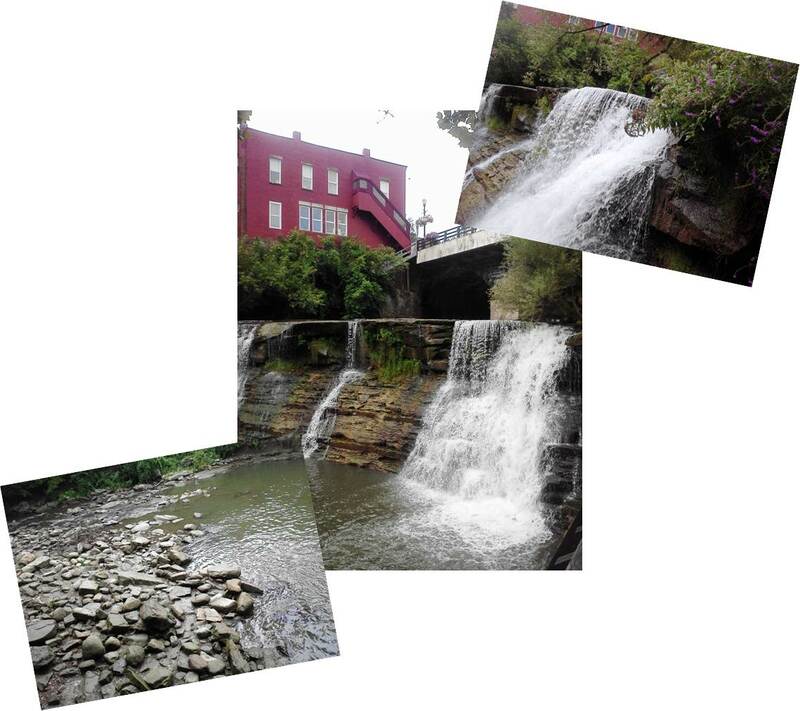 I’ve seen pictures of the falls fully functioning and would love to stop back to see if in full tilt. Awesome view from the other side of the falls. Definitely the more popular viewing location today. We took a few pictures and then headed back up to the main street to check out a few more shops, and I was excited to discover a Jeni’s Ice Cream! 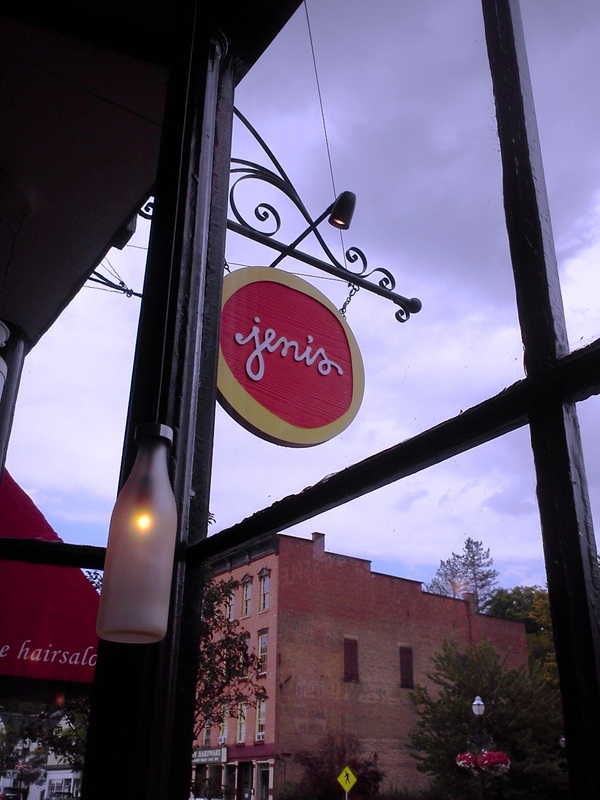 So many people have recommended Jeni’s but I thought they were more of a Columbus thing so I’d never even looked to see if there was one in Northeast Ohio. We were obligated to step in for a treat. I was surprised and delighted they had a decent selection of non-dairy options for the fiance–he loved this tart cherry sorbet he ordered, and I went with a half scoop of goat cheese and cherry ice cream and a half scoop of whisky pecan. Both were incredible! It was beautiful out by the time we were finished and back on the street, although there were still some rumblings of thunder in the distance. We crossed over the falls and headed down to catch a view from the other side of the falls for a few more photos and a little closer look. There were more people on this side of the falls, and I’ve seen a number of wedding photos done on this side. I think they would be very pretty, but you wouldn’t be able to keep your clothes clean climbing up and down for the pictures. We climbed back up and headed into the Popcorn Shop Factory to check out the popcorn flavors and old fashioned candy. We weren’t exactly sure how it worked–there were stanchions up to corral people by the popcorn, candy and ice cream and up to the counter to check out, but we were the only people inside so we didn’t follow the directions well. I did buy a small bag of cheddar cheese popcorn because our cat is obsessed with processed cheese! First time (but definitely not the last) at Jeni’s ice cream! 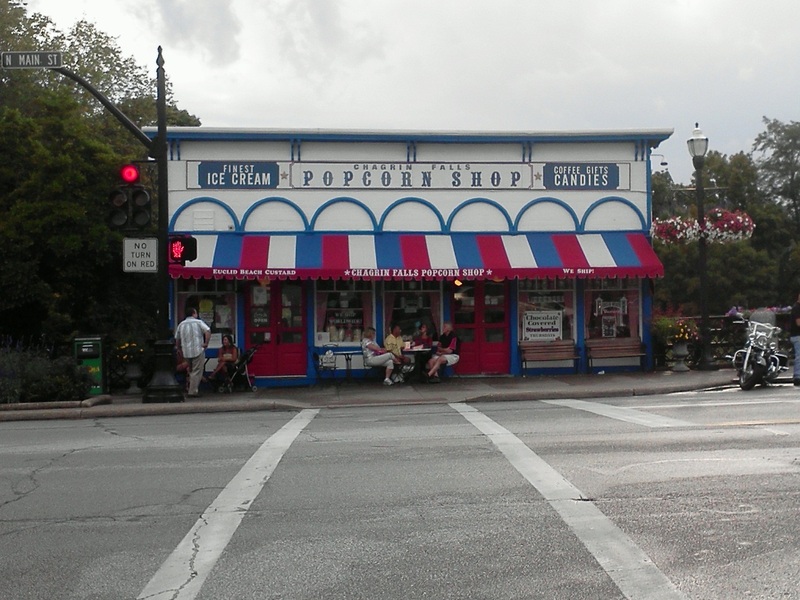 The old fashioned popcorn shop. We walked around the square and saw a pretty gazebo and a couple taking a ride in a horse-drawn carriage, and then we headed up a hill to see if there were any more shops we needed to explore. Almost everything was closed since it was Sunday afternoon, but we got a good idea of what was there and what we would need to check out next time we’re up. I was especially interested in a little wine and cheese shop–yum! We took one last look at the small green space and the park across the river before hopping on the bikes and heading home. We will be back, but probably not before we explore some other local haunts while the weather is still perfect for the motorcycles.